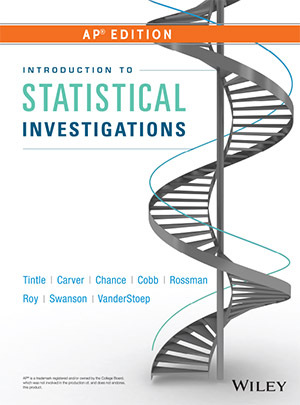 Introduction to Statistical Investigations AP® Edition is the first AP® Statistics book designed from the ground up to follow the GAISE recommendations endorsed by the American Statistical Association. Piloted by 22 AP® Statistics teachers and used by more than 1000 students over a 2-year period, this text is unlike any other AP® Statistics text currently available. To ensure maximum coverage of necessary concepts, every chapter includes content written specifically for the AP® Statistics course. Along with AP®-exam tips and AP®-style exercises found throughout the text, a chapter on preparing for the AP® exam is included. Two full-length practice exams (one in the text and one online) as well as a comprehensive set of 300 author videos round out the program. The authors introduce a spiral approach to statistical process through a six-step process of conducting statistical investigations. Students begin to develop an understanding of important and challenging concepts such as the p-value from the beginning. Then deepen their understanding as they encounter such ideas repeatedly in new scenarios where they reconsider and apply the six-step statistical investigation method allowing them to revisit, at deeper and deeper levels each time, the core ideas of statistical inference. CHAPTER 1 Significance: How Strong Is the Evidence? SECTION 1.4 What Impacts Strength of Evidence? CHAPTER 2 Generalization: How Broadly Do the Results Apply? CHAPTER 3 Estimation: How Large Is the Effect? CHAPTER 4 Causation: Can We Say What Caused the Effect? 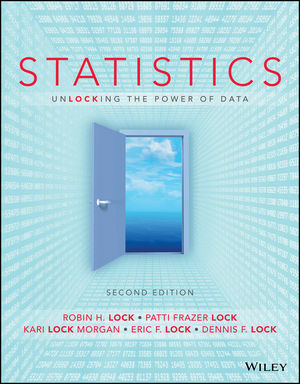 Statistics: Unlocking the Power of Data, 2nd Edition continues to utilize these intuitive methods like randomization and bootstrap intervals to introduce the fundamental idea of statistical inference. These methods are brought to life through authentically relevant examples, enabled through easy to use statistical software, and are accessible at very early stages of a course. The program includes the more traditional methods like t-tests, chi-square texts, etc. but only after students have developed a strong intuitive understanding of inference through randomization methods. The focus throughout is on data analysis and the primary goal is to enable students to effectively collect data, analyze data, and interpret conclusions drawn from data. The program is driven by real data and real applications. 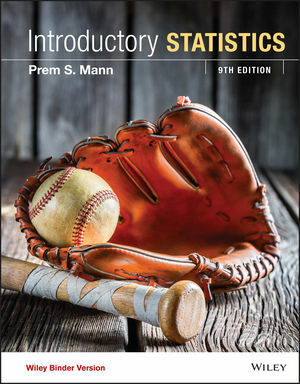 Introductory Statistics, 9th Edition with the online learning environment of WileyPLUS Learning Space provides the necessary practice, support, concept mastery and individualized instruction that ensure success in a High School Statistics course. With its Collaborative E-Textbook, My Notes personalization capability and Course Stream communication tool, WileyPLUS Learning Space will transform any course into a vibrant, collaborative learning community. This WileyPLUS Learning Space course includes ORION Adaptive Practice Algebra Refresher Module that gives students the opportunity to master algebra skills at home, allowing instructors to focus class time on Introductory Statistics. Based on cognitive science, ORION helps students build proficiency on topics while using their study time most effectively. Easy-to-use analytics highlight student strengths and weaknesses to give them the best chance of succeeding in the course. Contact us today for additional information about products, ordering, or any other comments or inquiries. Find your local Wiley representative by phone or email. By phone Please call our Customer Care department at (800) 225-5945 or (317) 572-3993. When calling, please have your account number (or SAN), ISBN(s), and invoice or purchase order ready. Representatives are available Weekdays from 8:00 a.m. to 8:00 p.m. EST. AP® is a trademark registered and/or owned by the College Board, which was not involved in the production of, and does not endorse, this product. Copyright © 2000- by John Wiley & Sons, Inc. or related companies. All rights reserved.